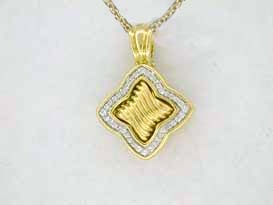 Lady's 18K Yellow Gold David Yurman Diamond "Quatrefoil" Pendant Enhancer. 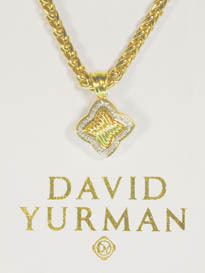 (NOTE: Gold chain is not included) We can order a Gold David Yurman chain if you would like, please call for pricing. 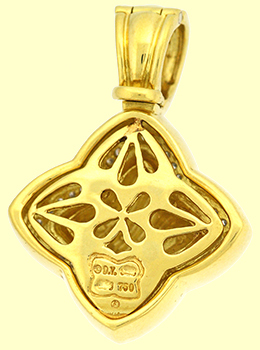 A new exciting style from David Yurman in solid 18K Yellow Gold! 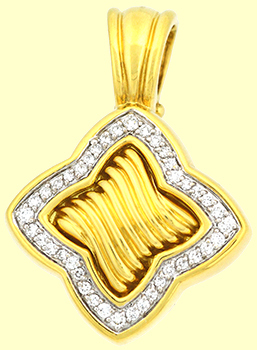 This piece celebrates David Yurman's new Solid Gold Couture Collection look. Everyone was waiting for David Yurman to go upscale. Well, here it is. And, of course, Capetown is known for upscale discounts. We are too old to change. This beautiful estate piece is in mint/perfect condition and, of course, all appropriate markings and hallmarks are intact. This is an investment in design that won't be seen on everybody's neck and you are buying it for alot less than the Neiman Marcus price.